The Pearl Anniversary marks thirty years of wedded bliss and. 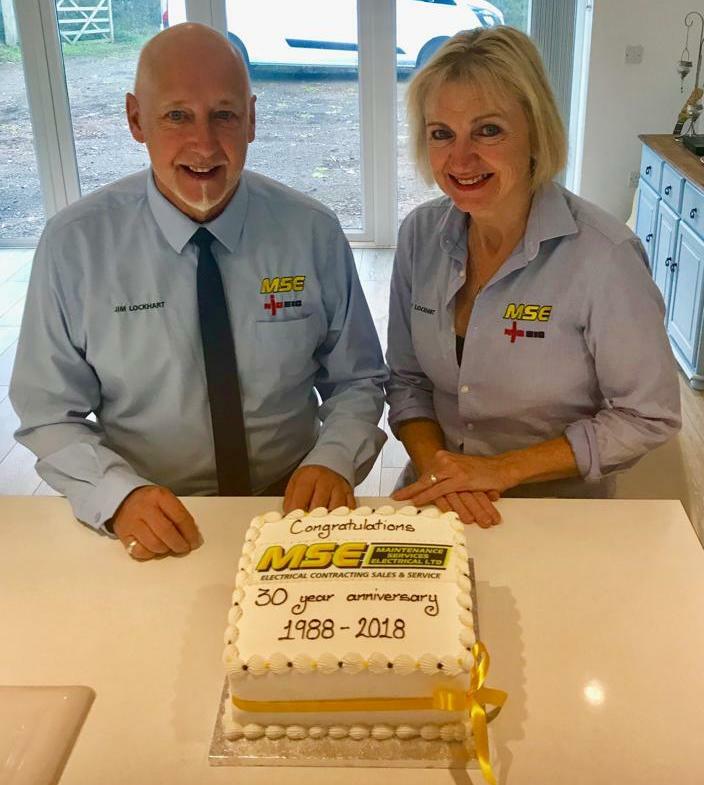 As MSE celebrated thirty years of business in November Managing Director, Jim Lockhart, could say that building a business is like a marriage. It takes time, commitment and dedication, but it’s all worth it. Here he is with business and life partner, Jane, and their business anniversary cake. Take a look at Jim’s thirty pearls of wisdom, gained though all these years of business experience. • We’ve all got to start somewhere, so don’t be afraid to take the first step. • Take opportunities when you can – I worked on major projects locally and in Humberside, so I was never afraid to take on big industrial and commercial jobs. • Be focussed - I saw a niche in the market for industrial and commercial maintenance. That’s where the name ‘Maintenance Services Electrical’ came from. • Understand your motivation – for me it was all about providing a good living for me and my family. • Maintain your standards – whatever you do, it must be done as well as you can possibly do it. • I left school without any qualifications, but my pre-apprenticeship training with the National Coal Board at Cowdenbeath Mining School and my apprenticeship as an electrician have taken me a long way. • You can always do more - I decided to go back to education in my mid-twenties. After gaining my first O-Level at night school I did a one-year crash course to gain the qualifications I needed to study a B Ed course. • Don’t be afraid to change direction – I quickly changed my mind and then did a BA degree in English Literature and Political History. Later I trained to teach English as a second language. • I’m still a big believer in training and education. I have had ten apprentices at MSE over the years and they have all done really well. That includes the Directors, Tom and Rob. • There’s always something new to learn. Tom and Rob have just completed the very difficult Level 4 City & Guilds qualification in Design and Verification of Electrical Installations. Only about half pass on this course and last year only 182 succeeded in the whole of the UK. • I’m not a big risk taker, so the business has grown organically. That’s exactly how I wanted it to be. • I spent some time as a sales rep for an electrical wholesaler which taught me the importance of face to face contact with my customers. • I’m a great believer in referral networking and I’ve been a member of Business Notworking International (BNI) for over 16 years. It’s provided me with a lot of high-quality business. • Maintaining the highest professional standards is a priority for me – that’s why we’ve been members of the National Inspection Council for Electrical Installation Contracting (NICEIC) for more than sixteen years. • Appearances give confidence, so we all have branded workwear, quality equipment and our vehicles are clean and well-maintained. • The people who have trained and worked at MSE have been chosen very carefully over the years. Every one of them knew that they had a job with us for as long as they wanted. • Support each other. Everyone has their strengths and can help out when needed. • Support outside interests too. I encourage the whole team to do what interests them. We even sponsor Rob in his motor racing. • Look after people. Listen when they’ve got problems and support them if they’re ill.
• Be reasonable. If something goes wrong, work together to sort it out. • Choose your customers carefully – you don’t have to take every job that comes along. • Don’t be the cheapest – just provide excellent value. • Do every job properly, and always check that the customer is happy. • Do what you say you’ll do. You can’t build and maintain a good reputation if people can’t rely on you. • Be professional in the work you do and the way you treat your customers. • Life is for living. Jane and I have had a great time growing the business and bringing up five amazing children. • Northamptonshire is a fabulous place for business with great access to the A14, M1 A and M6 – I owe the county a lot. • I’m genuinely grateful to have met so many wonderful people over the years. • We have a good reputation around Northampton that I’m very proud of – you know you’re doing something right when even your competitors praise you. • Like being a parent, you know that you’ve done a reasonable job when you’re confident that your children will do well when they leave home. I feel the same way about the business. Rob and Tom will be taking us forward now.